Truth is relative and personal. There is no TRUTH, so to speak and who would know what it was, if it did exist? Each of us sees things differently so what was true to one person wouldn’t be true to another. Thinking that’s there’s a TRUTH is what makes life so difficult because those in power want everyone to live by their truths and their truths have noting to do with our lives. Churches do the same thing. 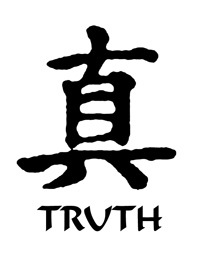 Truth only exists for us on a personal level. It can’t be any other way. But we can become wise by listening to ourselves and not to others. That’s my truth. Like the symbol and its meaning. I see you live in Ann Arbor, which is near Detroit. I like the Detroit music scene with Jack White hailing from there, Iggy Pop and most of all Bob Seger. thank you so much,, kathy. we shall see…. So many people are scared of the truth. Ive just had a friend who whose partner left her.. He said that he never wanted to get married (they were 18 and engaged), but was merely doing it to please her. She was stuck in this illusion and externalised her fear of being alone. Confronting the fear…is indeed confronting the truth. If she did so…she would be totally set free. I can’t wait to see her do so…shes so close! This is the real message we need to remember! Peace and truth, Beth. I like the earlier comment that truth is relative – unfortunately – nothing is absolute – not even the truth!